By today I was going to have progress pictures of the First Point of Libra Shawl but all that went down the drain when I came down with this itchy rash that keeps spreading. One of the things they over emphasize when you have a mastectomy and lymph nodes removed is don’t let anything untoward happen to the arm on the mastectomy side. That means no cuts, scrapes, blood pressure readings, shots or needles of any kind poking into it and no rashes. So naturally, the first place this strange, very itchy rash settled was on the arm on the mastectomy side. Of course this happened when no doctors were available on Saturday. All weekend I had to practice my no scratching technique, which isn’t a strong suit of mine. If there is a hell on earth itching and not being able to scratch is it. Over the weekend I tried every anti-itch OTC I could get from CVS. Nothing worked. By Sunday afternoon, between the itching with no relief and watching the thing spread, my attitude rapidly took a nose dive. Personality-wise I was like a demon in a horror movie. 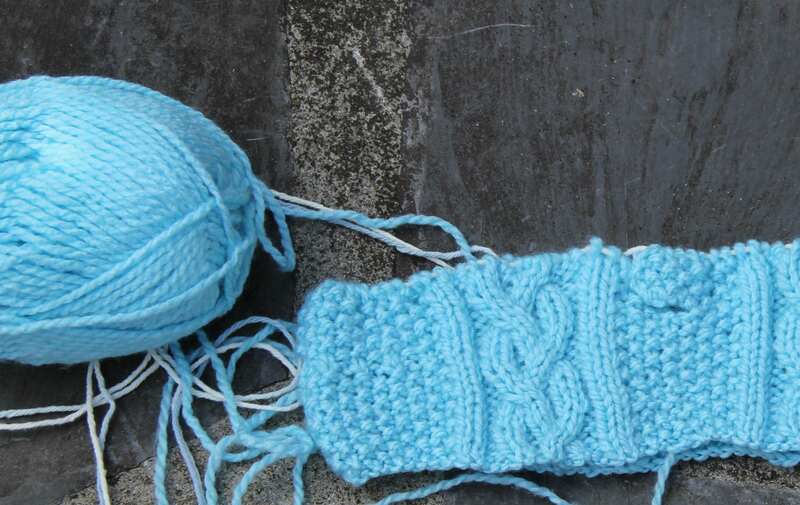 Knitting was put aside and I just sat, clenched my teeth and felt itchy. The Skipper perceived danger. He has a well-defined sense of survival so he picked the last rose of the year, brought it inside, put it in my cute little rose bottle and showed it to me. It looked adorable and the scent was heavenly. That little rose was the highlight of my weekend. Whenever I felt the horror movie demon take over I looked at and smelled my rose. By Sunday evening I took to freezing the itching area with ice cubes. I don’t know if one should do that or not, but it was the only way to get some relief. Sunday evening was the coldest night of the year, we dropped below freezing. Guess what I got between ice cubes on my skin, walking the dog all night in the freezing air, and clenching my jaw against the itch? A Monday morning head cold and temporomandibular (jaw pain). Today I go to the doctor with my head cold, jaw pain and the rash. With my luck he won’t know what the rash is, which will be the moment that I go into full panic and call my oncologist. Oh yes, and the neck sprain I had? Still have it. I’m falling apart. 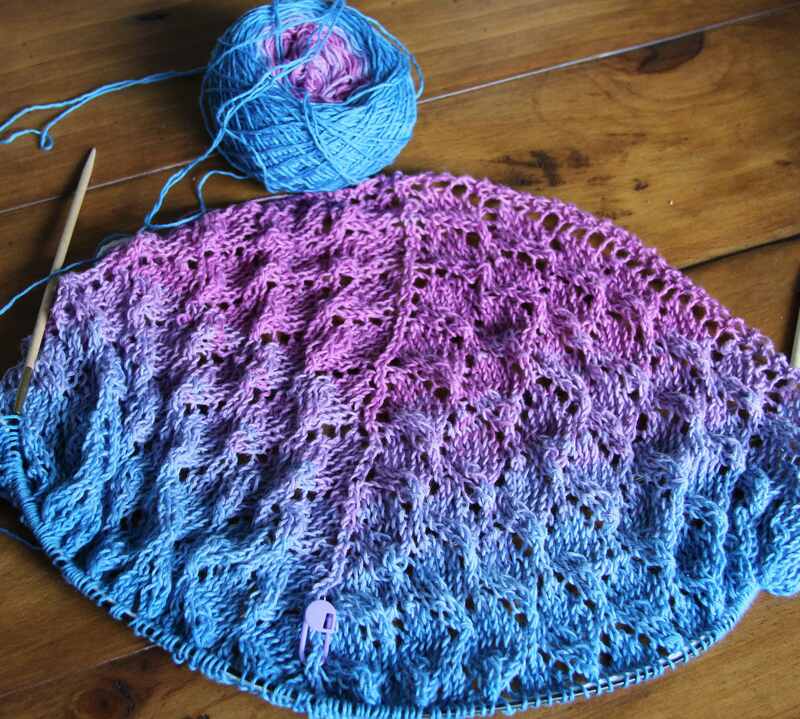 My KAL Lace Leaf Shawl with Claire and friends is coming along. The yarn is Schachenmayr Select Tahiti 99% cotton. It is the softest cotton yarn I think I’ve ever knitted. Also, I love the color changes–they are long and fade well in and out of transitions. Webs has it on sale this month. I bought a couple more in different colors. Each ball has 306 yds / 280 m in it, plenty for a small shawl worked on US size 5 (3.75)mm needles. The pattern for the shawl is well-written. Still, I stumble on rows 3 and 5, wanting to put yarn overs where they don’t belong. Whenever I reach one of those rows it’s all concentration on the knitting. The life line has saved my sanity many times. I just can’t seem to get the rhythm of those rows. Yesterday I had my MRI with contrast (ugh), my final big test this year to scout for any recurrence of breast cancer. The MRI was very difficult for me. I felt like a death penalty convict when they strapped the tube to my vein. I hate it when the radioactive stuff is finally released into my arm. I can actually feel it as it spreads through my body. My heart always stutter steps for a couple of beats as if it’s not sure it wants to pump this stuff through when it reaches there. It’s a slightly alarming feeling, but to stop the test at that point means I’d have to take it from the top all over again another day. So I grit my teeth and pray that my heart will normalize its beat on its own. For the past two years, I’ve had family members drive me to and from the MRI because I am so woozy for about an hour after the procedure. But I hate that feeling of dependency. So yesterday I drove myself. I sat in the car for about 30 minutes after the test waiting to get my bearings and sea legs under me. On the way back there was an accident that closed the road I was on for about 20 minutes. People are so impatient. Traffic wasn’t moving so I turned my car off but left the radio on. The station I was listening to was playing some pretty great songs from my beloved 1960s. So while those around me were showing signs of exasperation and impatience I was moving and grooving to my songs. Frankly, I was just so happy that the MRI was over with, a traffic jam was the least of my problems. The terrarium still lives. In fact, dare I say it? The plants look down right happy. Strange because I did some heavy root pruning to get them to fit into the bowl. I keep thinking of that old story about the guy who’s told how well he looks only to drop dead 24 hours later. I hope that’s not what’s going to happen here. Thankfully I don’t make lists. Though if I were to make a top ten list of things I should never do, watching the evening news while not knitting would be in the top 5 of that non-existent list. It only leads me into trouble. I lost the use of my right hand the other day after the vampires medical staff at my doctor’s office couldn’t find the vein in my arm and decided to use the vein in my hand to draw blood. Any kind of “blood work” excites medical people in the same way that a bar of good chocolate thrills a chocolate lover. Since I only have one arm to offer them, the other on my mastectomy side can’t be used for such things, drawing blood is sometimes an involved procedure. It was like that this time. I came home and knitted away, thinking nothing of the pain in my right hand. Just before the evening news began, I realized the pain was…well…painful. I put down the needles and in doing so made a big mistake. Rather than being the white noise in the background while knitting, the news became something I was going to literally watch and listen too. Just an aside here, television news is not my main source of information, I have a variety of respectable newspapers and magazines that I read to stay informed of things that annoy me and over which I have no control. As a former journalist, I am qualified to say that evening news casts now are not the evening news casts of then. I don’t know what to call them now other than some mish-mash of tragedy and comedy devoid of relevant information. But the “story” that lead me into trouble wasn’t a story at all, but a promo clip from a longer interview a child-like reporter did with Supreme Court Justice Ruth Bader Ginsburg. If I had been knitting, I would not have heard any of this. But I was not knitting. The part of the promo clip that got to me was at the end when the child-like reporter looks into the camera and announces that Justice Ginsburg does 20 push-ups a day. Justice Ginsburg is 81 and in questionable health. Really, 20 push ups a day? The child-like reporter smiles into the camera as it is the end of her segment and I am left feeling annoyed. Follow-up questions needed to be asked such as: Do you do 20 consecutive push-ups? Or do you space them out over a 24 hours period and do one or two here, another couple after lunch, then a few more with your wine at night? After spending a day of interfacing with the medical community and scheduling a battery of uncomfortable tests to see if my cancer has reoccurred or if a different cancer has sprung up in a different area of my body, I have burning questions about those 20 push-ups. I am 59 and I can’t do 20 consecutive push-ups. I can only do 7. And in all truth, what with my mastectomy, push-ups probably are not the best exercise for me to do. Nevertheless, I have been getting down on the floor each night and doing push-ups. I’m still only at 7, but I hope by next week to increase it to 9. If all my cancer tests come back negative, I should be on target to reach 20 consecutive push-ups by July 1. I will never watch another news show without knitting needles and yarn in hand. These push-ups are killing me. A new month, a Monday and the result is nothing short of a disaster in the making. I’m like the Titanic as the iceberg is ripping a hole in its side. The band is playing and I’m running around rearranging deck chairs, as if it will matter. First up the computer crashed. I am trying to repair it, but I’m having only minimal success. A pox on all those who purposely write malicious code. If I can step away from this instrument of torture and just do some meditation and deep breathing for 15 minutes I might hold off the migraine and come back with better ideas on how to fix this thing. But it looks like I am going to be down and off line for most of the week. Computer issues drive me crazy. Second, it is snowing. I know, it snows in winter, so what is the big deal. We had about 4 hours of ice before it turned over to snow. I’ve had a rocky relationship with ice, most of which has ended up in me going down. Bring up the sound on the Titanic music. Third, while Yarn Rascal has food, The Skipper just informed me that we don’t. If the man stopped eating everything that didn’t move, we’d have enough so I wouldn’t have to try and get to the store. A little louder with the Titanic music, please. Fourth, I saw my oncologist on Friday. We agreed that I am having some difficult side effects from the cancer medication I need to take for possibly the rest of my life. But just to be sure they are side effects and not something else, I need to see another doctor post haste and undergo a difficult, uncomfortable and perfectly horrid test. Just the thought sends my blood pressure and heart rate soaring. Then after that test I need two more, one of which is almost as horrid as the first. My doctor would like all these tests done this week. So I will be dealing with scheduling doctor appointments, test appointments and arguing with my health insurance company over all this. And the band plays on. Bring the Titanic music up to a crescendo for this next one. I don’t have a knitting project. Nothing. Totally empty needles. It’s been this way since I finished the latest shawl two days ago. Yarn that I was expecting hasn’t arrived. Knitting books I ordered are floating around somewhere in postal service limbo. I knit to stay sane. What more can I say? The weather is grey, wet and cool. Perfect, actually for a walk. I find a slow walk in weather like this refreshing. For some reason it releases me from what is troubling me. The bothersome bits I carry around fall away and I can breathe again. The doctor I saw yesterday says the pain on the mastectomy side is probably nothing more than muscle strain. This is the same doctor who said the cancerous lump in my breast was nothing to be concerned about. So I don’t necessarily believe what he says. On Tuesday I will check in with the surgeon who performed the mastectomy and see what she says. In truth, the pain is much less than it was. I see my cancer doctor this week and I see my radiation doctor at the beginning of November. I vote for walks in the rain and let’s see what these two doctors have to say. In the meantime, I had a small hair-on-fire moment where I full out panicked about not having any yarn. Trust me, the panic is not rooted in fact. I have yarn vaults into which Yarn Rascal and I could fall and lose ourselves for hours. The news week was heavy on the “world as we know it is ending” stories, combined with my own health issues and my response is, naturally, buy more yarn. Yes, catastrophe equals yarn purchases in my mind. Instead of buying yarn, I cast on for The Skipper’s winter hat. If I chain myself to the chair and knit 5 hours a day for the next two days, I can have it finished by Sunday night providing I don’t make a mistake that needs ripping back. The hat should use about 4 skeins of yarn, which means I will have to purchase 4 skeins of yarn to keep the stash numbers up. Yes, it all keeps coming back to buying yarn, doesn’t it? Everybody, including me, has body image issues. For instance, I refuse to measure my waist. The looks that attract me in a knitted or crocheted sweater don’t usually emphasize the waist, therefore waist shaping is minimal or non-existent in the pattern. But I need to know my other measurements if I am going to knit or crochet a sweater that fits. The king of all measurements is chest / bust size. This had never been a body issue area for me until I had my mastectomy. Talk about body image taking a hit, the mastectomy was a biggie. I didn’t know if I would or could ever wear a knit sweater again. I mean, how do I get a bust measurement with one breast? I cursed myself for not taking an accurate measurement before the operation, as if that should have been the upper most thought in my mind: take bust measurement for future knitted sweaters. An accurate bust measurement is necessary as it will affect all other measurements. My bra size is not my bust measurement. I didn’t know this until I was fitted for a special bra and prosthesis after my mastectomy. My bra size is the actual measurement I get when I wrap the measuring tape around my rib cage and back underneath and thus excluding the breasts. My chest measurement is 36″ (91) cm. But I wear a bra with a circumference of 38″ (96.5) cm so I don’t feel like a character in Downton Abbey all stiff corset and tightly laced in. For bra wear it’s the difference between the circumference of my chest sans breasts and the number I get when I measure and include the breasts that tells me what cup size the bra should be. It’s this latter measurement, however, that I use as a knitter to decided what size sweater I should knit. But here’s the thing about the king of measurements, it only rules until I get to the point in the sweater where my bust is at its fullest and that coincides with where my underarm starts. At this point, the king takes a hike. The new ruling measurement is the cross back width. If I want my sweaters to fit from the fullest part of my bust up, I need an accurate cross back measurement. The easiest way to get this measurement is to measure a shirt that fits me the way I want it to. Lay it out and measure the back from the top of one armhole to the other. 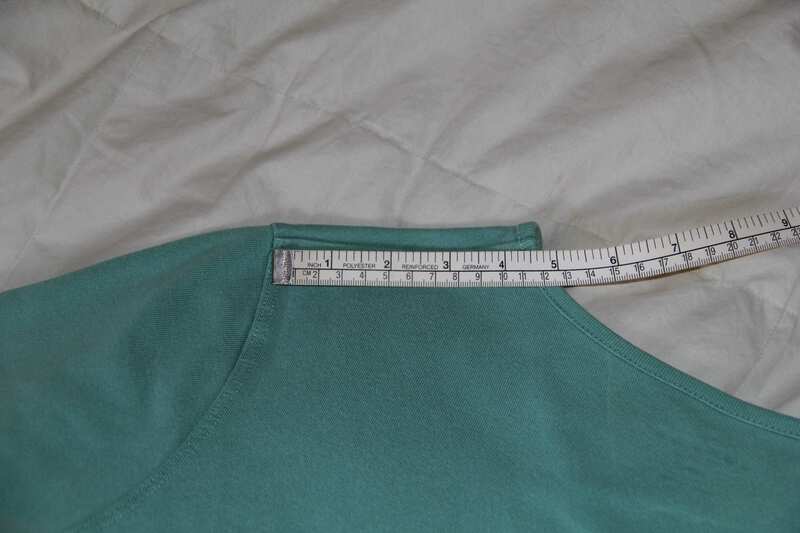 In the picture below, notice that the measurement starts at the seam created by joining the top of one sleeve to the top of the shoulder and ends at the opposite side where the top of the other sleeve joins the top of the shoulder. That’s the cross back. It’s a painless, body image-less, measurement. It doesn’t hurt in anyway to know this number. It’s neutral, a no commentary number. Next, I measure my shoulder width. Another neutral, no commentary number. 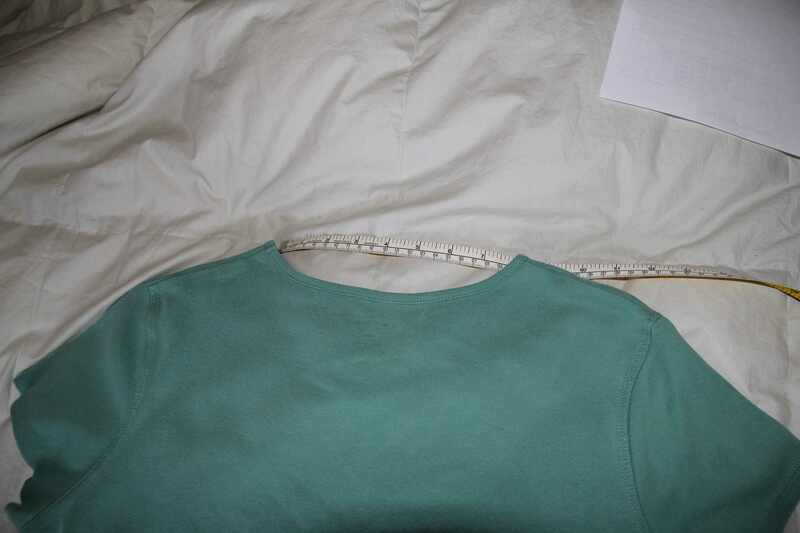 The shoulder measurement starts at the seam created by the top of the sleeve joining the shoulder, goes straight across and ends at the neck. 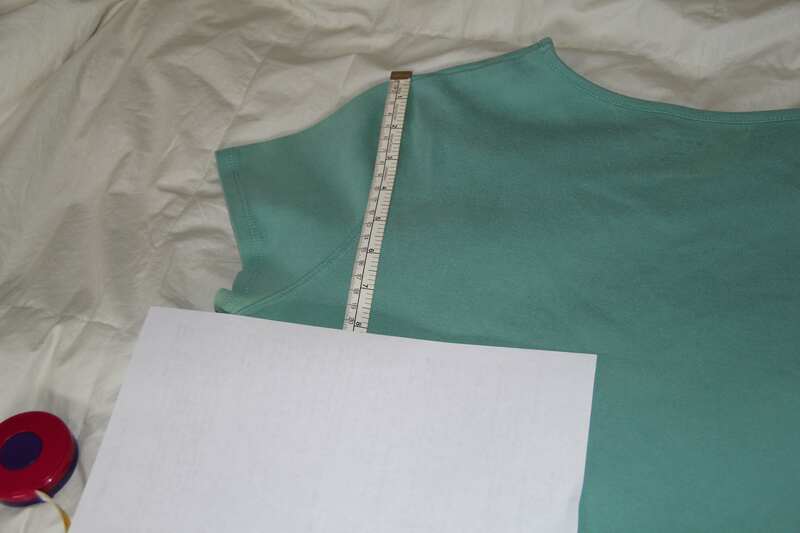 I don’t include the neck edging seam in this measurement. The next number I need is armhole length. I measure straight down from the top of the armhole to the bottom and put a second ruler, or in this case piece of paper, at the bottom of the armhole to get a clearer measurement. The last number I need is neck width. I find it tricky to measure this on a shirt. The area I need to measure is between the neck edge on one side and the neck edge on the other. What I like to do instead, is take the tape measure in both hands and put it behind my head. I slide both hands down the sides of my neck and along the tape measure until I come to the base of my neck where it curves into the shoulder. I bring tape measure and hands forward and record the number between my hands. Checking the accuracy of the individual numbers is easy. The cross back is the sum of my shoulder measurement times 2 and my neck width. If I have accurately recorded the cross back and one shoulder, I can easily find the my neck number without measuring. Multiply the shoulder measurement by 2 and subtract the answer from the total cross back number. What is left is the neck width. A small aside here. I’ve been looking for this yarn that I don’t know where I got it or what it is. At the suggestion of a friend, I am posting a picture of my mystery yarn in hopes that someone might recognize it and tell me what it is. The only other clue I can give you is that its a fairly heavy weight yarn being knitted on US 8 (5 mm) needles at 4.5 sts per 1″ (2.5) cm. I am positive it is not wool as Yarn Rascal has little interest in it.